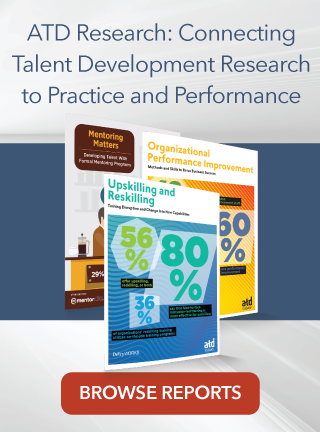 According to ATD’s research report Upskilling and Reskilling: Turning Disruption and Change Into New Capabilities, a third of talent development professionals have identified the need to upskill or reskill their employees—but have taken no action to do so. As the report found that strong correlations to better market performance and learning performance were associated with such programs, there is a great need for talent development to embrace upskilling and reskilling to develop employees. The report, sponsored by DeVry Works, defines upskilling as training designed to augment existing skills with new or enhanced knowledge or skills to enable individuals to continue to succeed in the same profession or field of work. Reskilling, meanwhile, enables individuals to gain new knowledge or skills to perform new jobs or enter new professions. These practices play a crucial role in helping organizations retain talent, engage employees, and meet changing business needs. For a closer look at what upskilling and reskilling might address and when they could be useful, this post examines programs at two organizations. One of ATD’s member-only 10-Minute Case Studies describes how Persistent Systems, a global company specializing in software product development and digital technology services, developed an upskilling program. When Persistent Systems began focusing on a new market opportunity to help customers with digital transformation initiatives, its talent development team knew the organization’s software developers and engineers would need new skills in this area. Their solution, the Full Stack Program, was a three-month blended learning program containing virtual, instructor-led sessions as well as e-learning and collaborative learning. The program offered five learning paths for developers to choose from and two learning paths quality engineers could select from. Each path included a different combination of courses. These features gave employees several opportunities to learn and practice their new skills—an important aspect of any upskilling program. To learn more about the program, ATD members can read the full case study for free. Upskilling and Reskilling describes how Atrium Health, a nonprofit healthcare network based in the United States, used reskilling to face an issue many employers and employees may struggle with in the coming years: job roles becoming obsolete. In response to this, Schmale’s team gave employees in unit secretary positions the option to reskill to become healthcare technicians. However, the healthcare technician role required a Certified Nursing Assistant (CNA) credential. To help employees meet this requirement, the organization adapted its tuition assistance program to cover all costs for employees to earn the CNA certification. Through the reskilling program, which spanned a year and a half, employees could continue to be paid while they were trained. Because Upskilling and Reskilling found that offering tuition assistance for reskilling is a practice strongly correlated to market performance and better learning outcomes, the report recommends organizations consider leveraging tuition assistance in their reskilling programs. To learn about more best practices for upskilling and reskilling programs, read the full report.